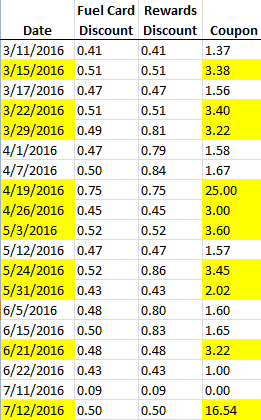 Double coupon Tuesday has been the bread and butter of our free gas tactics for the past several years. 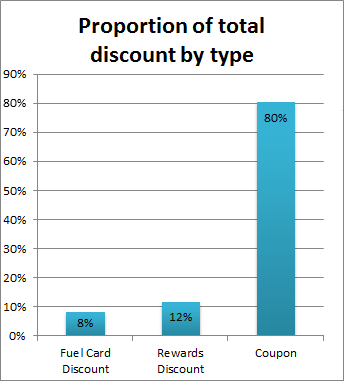 The policy would double the fuel discount on any coupon (even competitors’ coupons), every Tuesday. 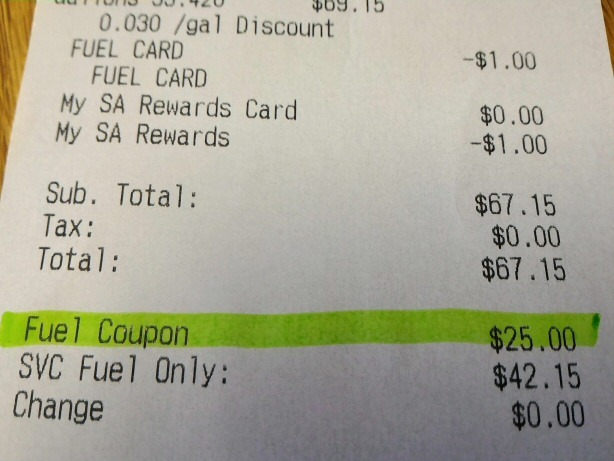 As I explain on the free gas page, this allowed me to trade in points for a $0.50/gal coupon every couple of weeks, use it on a Tuesday (making it a $1.00/gal coupon), and redeem it for the maximum 25 gallons to get $25 in free gas! With this and other tactics, I have received an average yearly discount of 13-19% on all gas purchases since I began tracking them. I am currently sitting at just over 19% for 2016. How much will this hurt the free gas tactic? As you can see, most of the coupon savings comes from Tuesdays. And the majority of the Tuesday savings comes from the big $0.50/gal coupon redeemed as $1.00/gal coupon. It takes 8750 My SA Rewards points to buy this coupon, which makes the points worth about $2.86 per thousand. Obviously you would never want to trade in points to use this coupon any day other than a Tuesday. After this change in policy, My SA Rewards points will only be $1.43 per thousand when used on the gas coupon. 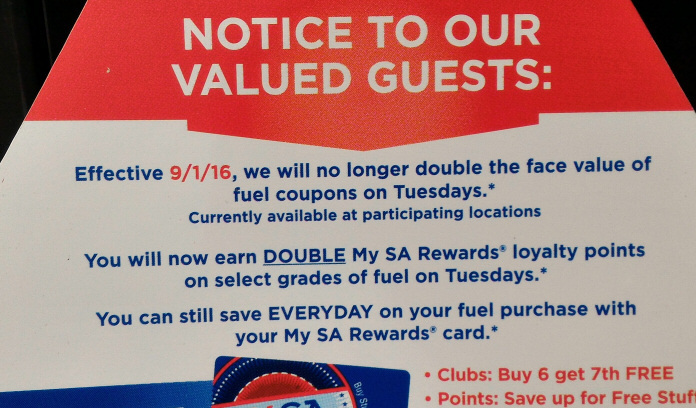 Very apropos to the post I wrote last week about not hoarding points, if you have My SA Rewards saved up, find a way to use them on gas coupons in the next 3 Tuesdays! A small positive side effect of the change is that it no longer matters on which day you use coupons at SA. This is a slight increase in convenience, which does have a small amount of value in my mind. I will be checking through the redemption options for My SA Rewards to see if there is another, more efficient use of points now that the gas coupon is half as valuable. There’s a chance that other local stations such as Holiday or Kwik Trip would double coupons on Tuesdays. This has been reported in the past but without the need to compete with SA, it’s unlikely they will do so now. Like everything else related to the ValueTactical arts, we are at the mercy of the whims of the program administrators, banks, airlines, and hotel chains. Programs change all the time. Instead of getting down about it we need to simply adapt and find the best way to maximize whatever opportunities are out there at this moment! This entry was posted in Gas Discounts and tagged Super America on August 10, 2016 by Gomanson.